When the Daedra-worshiping Ayleids fled from Alessia's Slave Rebellion in Cyrodiil, many of the clans went south into Valenwood. 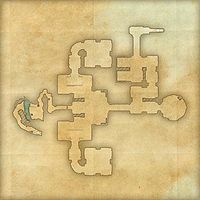 Legend has it that the Abamath Ayleids drove a tribe of Wood Orcs out an existing cave system and converted it to their own uses. 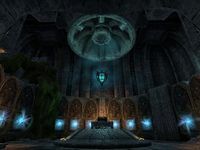 Shrine of Mauloch: Is Mauloch the Aedra different from Malacath the Daedra, or are they a single entity, cast out by both groups of Divines? No one can agree as to the truth of the matter—not even the Orcs. Abamath is an Ayleid ruin in southern Malabal Tor, northwest of the Grahtwood gate. Abamath Objective: Help the Wood Elves prevail against the Worm Cult. Arithiel: Rescue Arithiel from the Worm Cult in Abamath. The Soul Trap: Rescue a Khajiit's soul from an Ayleid puzzle lock. Abamath Wayshrine is located across the Xylo River, east-southeast of the ruins.